St. Mary’s Stadium has decided to use Panomera multifocal sensor technology from Dallmeier when modernising its CCTV system. The Stadium is the home of Southampton FC and holds more than 32,000 spectators, making it the largest football stadium in the South of England outside of London. A video surveillance system has been in place in the stadium for many years, monitoring the spectator terraces, the club shop, entrances and car parks – however it was deemed time to update the system. “Previously, we had used analogue cameras, and now we wanted to change to HD technology, to improve image quality, particularly for monitoring the terraces. The stadium is sold out regularly, and with the new video system we can offer our visitors even greater safety,” says Mark Hannibal, Venue Safety Manager. The safety officers decided to place their faith in the Panomera MFS technology from Dallmeier for their monitoring needs, particularly for safeguarding the visiting fans area in the north terrace, called the Northam Stand. “We had heard about this new technology at a conference held by the Football Safety Officers Association, and we then talked to Everton FC, who were already using the new camera technology in their Goodison Park Stadium,” Mark Hannibal continues. MFS technology makes it possible to keep the entire northern stand in view at one time. Even when the security operators are currently zoomed in on a suspicious individual, unlike with conventional PTZ cameras the system continues recording the rest of the scene. This then ensures that no incident is unseen and can be investigated in the highest possible resolution at any time afterwards as well. The safety officers were convinced of the technology’s capabilities with a test installation at a Southampton FC match. 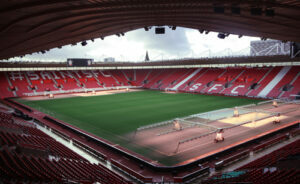 More than that: St. Mary’s Stadium decided to implement not only the Panomera but an entire installation by Dallmeier. The entire system including the workstations was already preconfigured by Dallmeier prior to shipping and the equipment was installed by Caldera Fire & Security, who had worked previously as the installer for St. Mary’s Stadium. After commissioning, both Caldera and the stadium security operators received training from Dallmeier. The Stadium is happy with its choice. “The clarity of the images has dramatically improved the view of all supporters, we have already marked up our first successes with it. Several offenders have made admissions of guilt very quickly after being confronted with the excellent imaging material,” says Mark Hannibal.